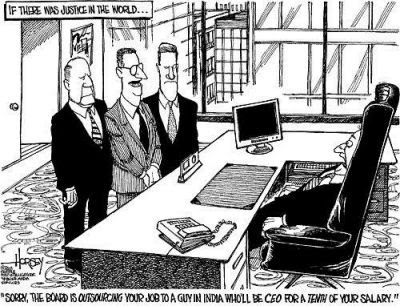 This is one of my all time favorite cartoons.. it really brings the overseas outsourcing of US jobs home to me.. albeit with a bit of a twist. Frankly, I wasn't too interested in this issue when many auto industry jobs were sent overseas.. sadly I only became interested when it affected the people that I knew and worked with. If you are interested in this issue keep tuned in to Matt's blogsite to see if any of the other candidates respond or send a non-response.